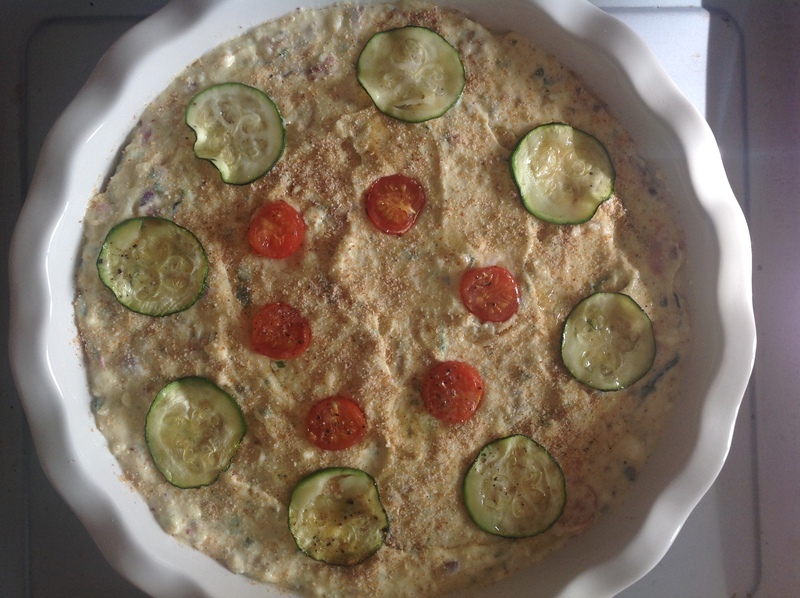 You cannot call this a frittata and you cannot really call it a quiche either! It is a somewhere in between. 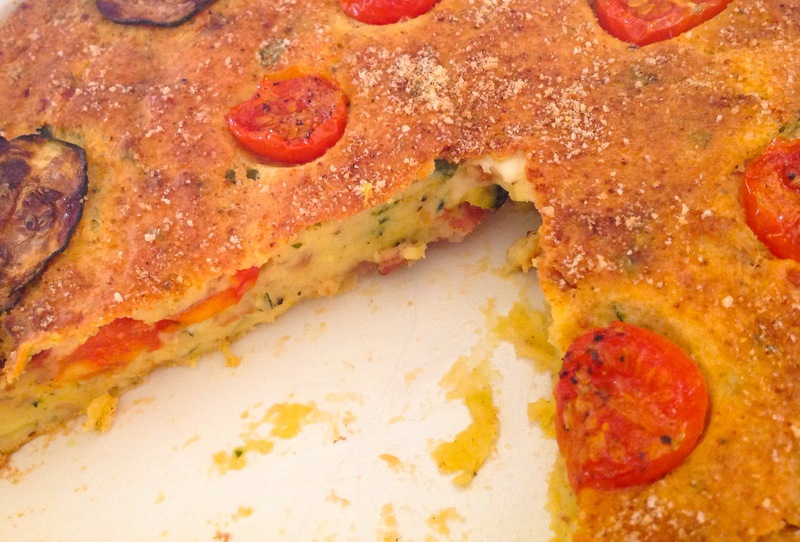 It is lovely served with a crisp salad and can be eaten both warm or cold. Sauté the onion and garlic in a little olive oil till translucent. Add the cubed speck, cooking for about 3 minutes. Place the zucchini slices on a lined baking sheet, brush with olive oil, season with salt & pepper and place in a preheated oven 180C, and cook until they turn start to turn golden. Put some aside for the top. Mix in the baking powder with the flour. Place the ricotta in a bowl, and beat until smooth. Add the beaten eggs and the flour, little by little, until it is well combined. Add the speck, onion, garlic mix, the parmesan and the zucchini slices and combine gently. Season with salt & pepper. If the mix is too thin, add a little more flour, if it is too thick, add a little milk. Lightly oil an oven proof dish, sprinkle with gluten free breadcrumbs or polenta. Pour the mix into the dish, and level. Sprinkle the top with more breadcrumbs. 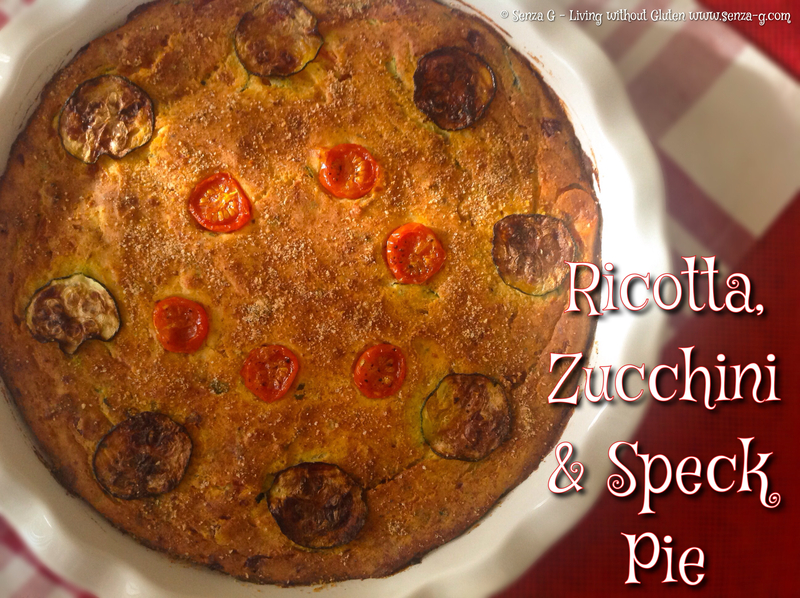 Place the zucchini and the tomatoes decoratively on top. Place in the oven and bake for about 45 minutes at 170C, or until it becomes golden. Leave to cool slightly before slicing. Serve either hot or cold with a salad.